The hype around 3D printing has created a lot believers in a ‘new industrial revolution’ where everyone can make their own products, from cars to action figures. Though consumer-facing 3D printers can make some pretty cool stuff nowadays, CES Asia’s talks on 3D printing last Friday made it clear that the future of 3D printing technology belongs to companies. “Do you think it’s realistic? Will [3D printing] be a necessity for every household? I don’t think so,” he said. A 3D printed hip implant. This year, industry experts at CES Asia focused on industrial 3D printing instead, touching on applications in B2B and B2C products such as customized medical devices and lighter airplanes. 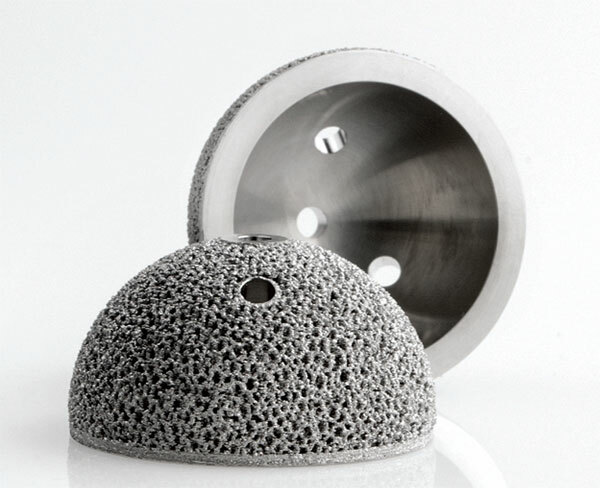 For example, using 3D metal printers, companies like Arcam have been able to create hip implants that look like titanium cups of foam, porous enough for tissue to grow into. Last December, Autodesk partnered with aircraft manufacturer Airbus, to design 3D printed airplane parts that would reduce the weight of Airbus’ airplanes and save fuel. 3D printing technology has been around for several decades, but its popularity in mainstream media only took off recently, coinciding with a larger, worldwide movement around “makers,” or everyday people who are empowered to create things on their own. In 2012, Chris Anderson, the former editor-in-chief at Wired Magazine and author of Makers: The New Industrial Revolution, said that 3D printing would be “bigger than the Web.” For consumers, that might be an exaggeration, but for industry players, such as automobile and aircraft manufacturers, 3D printing has the enormous potential to reduce costs and offer customization at scale. He described the impact of design automation, which has enabled companies to automate and scale the design process. For example, RSPrint, a joint venture between Materialise and RSscan International, creates customized 3D printed insoles using gait analysis and design automation. “Every person is different, every person’s feet is different, every person’s walk is different,” said Mr. Van de Perre. By analyzing a person’s foot shape and the distribution of pressure across their feet while walking and running, RSPrint’s software makes design suggestions, which sports specialists can adapt manually if needed. Materialise has also worked with Phonak, a hearing aid company, to cut down its design process for customized hearing aids from “two days…to two minutes”, according to Mr. Van de Perre. Autodesk, which is best known for its 3D modeling software, AutoCAD, has also focused on improving the design process for 3D printing and product designers. Specifically, the company is looking at ‘generative design,’ where cloud-based software can automatically create a product design based on user requirements. Autodesk Within’s design of a load-bearing engine block. “You just have to tell the computer what you want, what you want it to do, and you can also provide some parameters on limitations, [like] a certain weight, the strength of the materials,” said Mr. Lu. He showed an example of a load-bearing engine block that was automatically designed using Autodesk Within, a set of generative design software solutions for engineers in automotive, aerospace, industrial equipment and medical implant industries. However, in addition to touting the potential of 3D printing technology, both Mr. Lu and Mr. Van de Perre addressed the flaws and trade-offs of 3D printing, such as limitations on speed and printing quality. In particular, both speakers reacted against the ubiquity of consumer-facing 3D printers and the overall hype around 3D printing tehnology. “I want to avoid [the situation] where people say, ‘3D printing is very cool, let’s buy a machine!…What shall I print?’,” he said. Image credit: Arcam, Autodesk, Airbus.